The barbell bench press may be one of the most basic and most widely-used upper body strength exercises in the gym. It’s a compound movement that can do well to strengthen the chest, shoulders, and triceps. The problem with overhead athletes is that the risk-benefit isn’t really there. When we do initial evaluations for swimmers, we always ask about prior training history. Commonly, those with a history of shoulder pain will mention the barbell bench press as a consistent pain-producing movement. Even those without chronic pain point to it as an exercise they say just doesn’t make their shoulder feel good afterward. Why is this such a bad exercise for swimmers? For starters, swimmers tend to be on the hypermobile side, meaning they have too much range of motion. One area, in particular, is the front of the shoulder. Anterior shoulder laxity can lead to anterior/superior migration of the humeral head (ball) in the glenoid (socket) leading to many different kinds of issues with shoulder impingement being just one of them. Compound that with a typical forward head posture and rounded shoulders and you’re in for some issues down the road. For proper execution of the bench press, you’d want shoulder blades locked down and back, global spinal extension (back arching), and motion of the humerus without the glenoid. None of these are ideal for an athlete that is already prone to shoulder and lower back pain. So, what’s better? A pressing exercises that gets swimmers out of spinal extension and allows the shoulder blades to move freely. Some of our favorites include push-ups, landmine presses, cable pressing, and one-arm or alternating dumbbell floor presses. Overhead pressing, while common in most strength and conditioning programs, is one of the exercises we are most cautious about giving our clients and athletes. When I say overhead pressing, I’m referring to true vertical pressing usually with a barbell or dumbbell. While we do program this for some of our clients assuming they have the requisite mobility, we don’t choose it for our swimmers or other overhead athletes. If we’re looking at overhead pressing, there are actually many degrees of overhead pressing we can take into account. I’d consider overhead pressing with a barbell or dumbbell as being the most advanced variations. They require the most mobility and they have the least amount of freedom in terms of movement. They also tend to result in the most compensations. Give someone a barbell to press overhead without adequate shoulder mobility and you’ll see movement through the lower back and a forward head posture. Many swimmers are hyperextended through their lower back and have a forward head posture. Why do we want to feed into that even more? Not only that, but take an overhead athlete that already completes a ton of repetitions of overhead motion, such as in swimming, and maybe it’s just not a great idea to put them in heavier loaded exercises that require them to be overhead even more. Instead, we can choose more shoulder-friendly options that still get a good training effect, don’t risk injuring the athlete, improve shoulder strength, and improve shoulder stability. We like exercises like the landmine press, yoga push-up, and overhead carry/hold variations. The bench dip is a common dryland exercise when equipment is limited. Seems easy enough to move to the edge of a bench and get some triceps work. Heck, you can even do them on the pool deck. Well, the issue lies in the position that you have to be in to do the exercise. We already talked previously about anterior shoulder laxity being common among swimmers and other overhead athletes because of the range of motion required to participate. At the top of the movement, the athlete will be in a “neutral” position, but at the bottom, with the elbows way behind the body, this position puts a lot of stress on the front of the shoulder. What do you think this position does to the biceps tendon and anterior glenohumeral ligaments if the rotator cuff muscles aren’t in perfect shape and firing on time? If you guessed “stretches them out,” you’d absolutely be correct. This is one of the last things you want to do to a swimmer’s shoulder as, over time, loose ligaments mean unstable shoulders, which leads pain and injury. There are better ways to work triceps. Any pressing movement involves extension at the elbow joint, so you’re going to use your triceps to do something like a push-up or 1-arm landmine press. Aside from those exercises, a simple triceps pressdown, a narrow position push-up, or a straight-arm pressdown would be great choices to train the triceps without destroying your shoulder in the process. Lucky for you, I’ve included a bonus. And it’s a good one. To give some background, I have heard about running being prescribed for swimmers for a long time now, and quite frankly, I don’t understand why. Now, there are worse exercises I can think of for swimmers, with burpees topping that list, but running is still pretty bad. If you look at running and how it might improve swimming, it may seem somewhat logical. It can improve your cardiovascular system and improve your aerobic system. The main issue lies in the swimming population. Swimming tends to be a year-round sport with little off-time. A lot of our swimmers have been exclusively swimming for many years now, meaning their land-based athleticism isn’t quite as strong compared to other athletes. It makes sense. Their sport takes place in the pool. And we have tons of anecdotal evidence having trained many swimmers. Running is basically a series of plyometric repetitions with forces of up to three times bodyweight being exerted on each stride. Combine that with an athlete that tends to be less stable and more on the hypermobile side, and you’re risking a decent amount of injuries. It’s just not worth it. Instead, there are several things you can do. 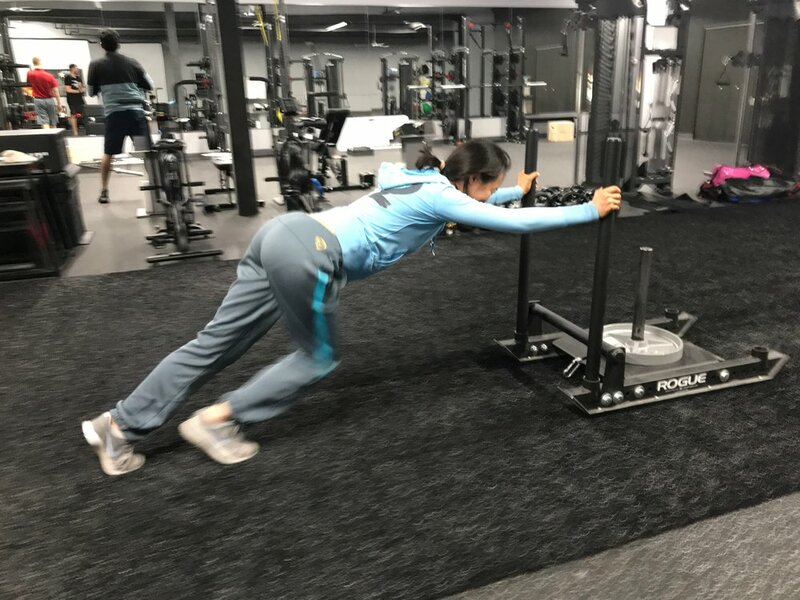 We like sled variations like a march or reverse drag as we get the cardiovascular effect, no impact forces, and some very advantageous adaptations at the muscular level like improving the ability to buffer hydrogen ions that cause muscle fatigue. One of the main things to consider in dryland training is the risk-benefit of certain exercises. We definitely want to improve performance, but we don’t want to get injured trying to do that. Considerations need to be taken into account when designing a training program for swimmers, and a general one-size-fits-all program is not the way to go. Please use this article as a reference for your own dryland training to make sure you stay on track to reach your swim goals without unnecessary risk.